Why are elite American institutions teaching students to regard the symbol of the United States as an offensive one? Who is responsible for this culturally suicidal trend? Why wasn’t it nipped in the bud long ago? [Tangential observation: Anyone who talks about the border conflict while using the phrase “tear-gassed women and children” deserves to be rhetorically crushed in the toughest possible terms. It is signature significance for an ignorant jerk. At this point in history, any progressive who defaults to the 20th Century concept they have relentless mocked and derided, that women are a tender gender that deserves special delicacy in all things, is a fraud and a hypocrite. If the men trying to rush our border and stone our agents are justly tear-gassed, and they were and are, so are the women who support them. As for the children, they are not being tear-gassed; the adults who disgracefully and cynically use them as human shields are, and the children, due to the cruelty of those who should be keeping them out of danger rather than thrusting them into it,, are the victims of criminal activity. Last month a survey reported that “Younger Americans are turning on the country and forgetting its ideals, with nearly half believing that it isn’t ‘great’ and many eyeing the U.S. flag as ‘a sign of intolerance and hatred,’ according to a new and disturbing survey.” If this is accurate, then, in order, parents, the education system, irresponsible politicians and the new media are my first candidates for the accusing finger. The fact that someone like Donald Trump is the most visible and prominent advocate for patriotism is certainly not helpful either. This is an existential development. American values are linked to the nation itself. If people reject the nation, those core values are also at risk. No wonder attacks on our institutions, efforts to unravel the Bill of Rights, minimizing American contributions to world civilization, and other efforts to erase the essence of our culture are suddenly finding more success than ever before. Once, the Stanford story would be dismissed as an outlier, “News of the Weird.” No more. In fact, we have been dangerously blase about such stories. It’s time to take them seriously. Oh—that Stanford fraternity responded to the anti-flag tip by buying, and flying, a bigger flag. That’s the America I know and love. Let’s fight for it, shall we? I don’t even think that’s the primary reason. I think that’s a side battle that arose from ignorant youths who latched on to a “cause”. The primary reason for teaching a completely un-nuanced view of American history is to more easily smear anyone who tries to analyze history in a nuanced way as “racist.” Primarily, as it is increasingly the case, only conservatives seem to appreciate our American heritage and American political values, so inevitably it is only conservatives who can see American History as a nuanced stream of thought and conflict and can accept America’s greatness in spite of its sins. Leftists, who hate American heritage and political values, need to erase everything but America’s sins so they can smear those of us who love its values as evil monsters. That’s the primary reason for the Left wanting to teach dishonest history in American schools. Congrats Michael. Can’t argue any of what you said. Good stuff. Congratulations Michael. Thought inspiring comment. My perspective is that the left entered a “new” rhetorical phase after the election of 2000 and has put it in high gear in all phases of society since Trump was elected, that phase is to throw out all logic and reason and use condemnations of “evil” as societal and political terrorism to force the public into submission. This evil rhetoric is especially noticeable when they fail to get their way politically. Let’s face it, being labeled as evil is a terribly hateful thing to do to a person and it’s socially isolating when in people generally want to be liked and accepted in society. 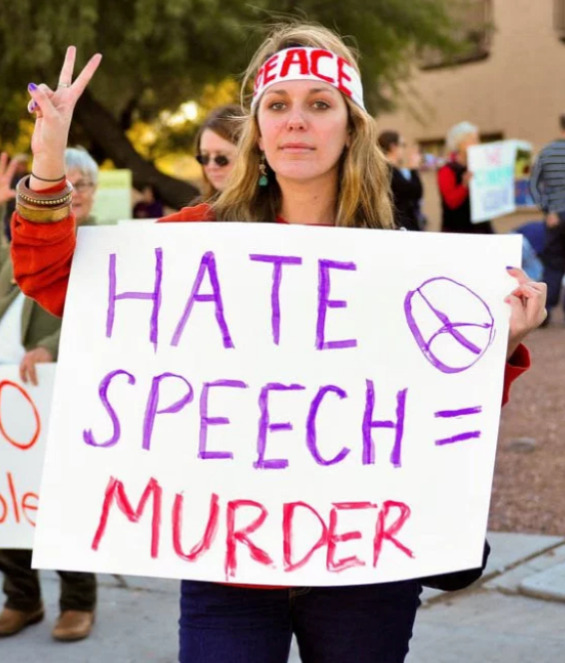 Once the left has labeled something or someone as being evil it’s much easier to convince society that it’s justifiable to destroy it; this is exactly where we are headed with the free speech rights of anyone that opposes the left, they are evil and they don’t deserve free speech rights. The kind of thinking that inspired the person in that photo is no longer isolated thinking, it’s all around us. These people are the future of the United States of America and they will willingly destroy it. Is that an undergraduate Liz Warren? It’s the way all totalitarians work. Find a substantially sized subset of the population, determine they are the CAUSE of ALL the problems of the REST of the population. Never hurts to read a poignant comment more than once. This should be included in the preface of every American History textbook. I’m beginning to think Saul Alinsky and his acolytes have prevailed. Donald Trump is the most prominent Pro-American because he has to be. You have to be a brash person who doesn’t care about the feelings of others to care about America and American values today. If you cared about the feelings of others, you would be sensitive to the fact that they hate America. Only someone arrogant and self-confident in the fact that they are right can just disregard such people. You have to be able to shrug off a ‘racism’ accusation to note the accomplishments of America You have to be able to ignore the ‘nazi’ label to be proud of our ideals about equal rights and individual rights. You have to be unconcerned about being labelled ‘alt-right’ for believing in the meritocracy. You need to be able to laugh off an ‘anti-semetic’ label for hiring a bunch of Jewish people. What leader other than Trump can do that? If I’d even remotely thought it would be a COTD I might have put a little more thought into it’s composition so as to save people having to read it more than once. Tempted to write several times, but never felt I would have the time to do my thoughts (or the topic) Justice. Not that I consider myself a good student of history, but even big idiots can usually crack the 90th percentile (and I am a bigger idiot than most). Progressives are undoing a grand bargain. Grant won; Lee lost; Grant let the defeated army walk home; and Lee agreed the cause was lost. Both sides saved face; they agreed to bury the hatchet. The South had formal and substantive arguments that formed the basis for secession (or war). That issue was put to rest and both sides were able, through the wisdom of the generals on both sides, to put an end to the fight. The hatchet has been dug up by the progressives. The honest differences cannot be entertained. There cannot be honor on both sides, which was the deal struck (even for the losing side). The implicit agreement to let the past be the past has been ripped open by those lacking the wisdom of the Founders, who kicked the can down the road, or Grant and Lee, who decided to stop kicking it. By insisting on good and evil, on right and wrong, the progressives want to dismantle the gentleman’s agreement that has allowed the United States to move forward; they want to move the country backward. In light of this, a few clarifications are needed: clarifications lost on most Americans because, but for the stupidity of the progressives, they would not be needed. The American Revolution was not a revolution. The French Revolution, which sought to overthrow the government, was a revolution. The United States merely asserted (declared?) its independence. The Civil War was not a Civil War (or a War if Northern Aggression). England had civil wars, where two opposing sides fought for control of the government. That was not our “Civil War.” We had the South engaging in a War of Independence, neither a Revolution, nor a Civil War. If we bamed our wars correctly (or more accurately), we might have a better understanding of history. Only because there is a sufficient number of typos to make it look like Jack wrote it. The phone; that is how. I don’t make a big deal about typos, because they are more a matter of typing than ability to spell or construct sentences. But, Jack is admittedly notorious in that regard. So, when I screw up typing, it ticks me off, especially on my phone. I don’t like typing in my phone for that very reason, but you have to do it if you want to contribute something meaningful. That is a COTD, though. I’ll fix the typos. No, too many others to step in. But i do sympathize when my keyboard and my finger disagree. VERY interesting perspective!!! I agree, that’s a COTD. What we have been shown from the words and actions of Progressives is that the world view through the eyes of a Progressive is the ONLY acceptable view of the world and everyone else is wrong. You can find my full viewpoint on the topic of POLITICS AND THE BRAIN. Push the slider up to 1:25 in the Senator Hirono video. Interesting analogy presented by Senator Hirono between 1:44-2:05. Think about that analogy for a while. It’s clear to me that that analogy is definitely not how the Democrats speak to people, the Democrats speak to the core emotions of a person trying to get the core emotions to override the intellectual part of the brain. So that’s talking to the intellectual part of the brain? Okay, I’ve gone down this tangent far enough.